Since the inception of the Cree Language Resource Project the technical partner Intellimedia Inc. with assistance and support of educational and linguistic experts developed a collection of software tools. The main goal was to make resources of the online dictionary more accessible to the public, for that reason have been developed desktop widgets for Windows and Mac OS. In addition we developed add on and extensions for Joomla! content management system and Moodle curriculum management system to integrate syllabics virtual keyboard. Cree Dictionary on an iOS device? Why not? Using the power of Apple iOS 4+ Cree Dictionary provides the best user's experience and mobility. Android application Cree Dictionary application for millions Android OS devices. Cree Language Resource Project is following the trend of moving of information resources to mobile platforms. We developed a version of the website adopted for Apple iPhone and iPad devices. 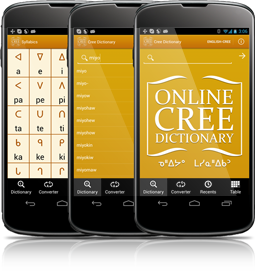 Essentials of Online Cree Dictionary website now in suitable format your mobile browser. Enjoy! A free dashboard that makes Cree Dictionary accessible in one click. Working on Mac with cree text? Need a Cree Dictionary reference, translation? You are welcome to use it. It's well known that Mac OS Dashboard widgets are extremely easy to use. In a click you have Calculator, Calendar, Weather and Translation tool before your eyes. For those users who work with Cree language we present Cree Converter widget. Get it and have a Cree Conversion assistant in away every day desktop activities. Free tool for users of the most widely used desktop platform. No need to open browser to access Online Dictionary. Install the gadget and have Cree Dictionary on you desktop. If your computer running Windows 7 or Windows Vista you might like this too to convert Cree text from Roman Orthography script to Cree Syllabics. This easy to install component will make your Joomla! based site more functional for Cree users. The component allows to have Cree Syllabics input embedded in your site. Moodle is one of the most popular and spread curriculum management systems. During implementaton of a solution for Miyo Wahkohtowin Community Education Authority (MWCEA) we found that a Cree virtual keyboard can be a perfect addition. Our development team did a great work adopting virtual keyboard from Online Cree dictionary website for Moodle. This might be a really aid in creation of Cree langage related curriculums with Moodle CMS. If you find Cree keyboard layout of Online Dictionary virtual keyboard useful you might want to have it on your desktop. This is easy to do. You can download and install Mac OS keyboard layouts bundle for Maskwacis Plains, Saskatchewan Plains and Woodland Cree dialects and have them as natively as your standard keyboard layout.